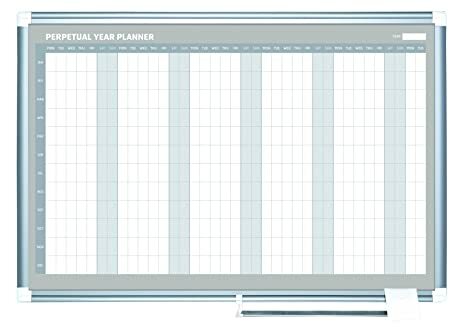 GA05106830 MasterVision Planning Board Magnetic Dry Erase 12 Month Calendar Board with Aluminum Frame, 36" x 48"
Organization is vital for the success of every business or enterprise. MasterVision Planning Boards are excellent tools that allow you to keep scheduling and planning on time. Keeping important dates & tasks on display, organizing work-groups or just planning ahead is practical and easy with our many calendar formats. Organization is vital for the success of every business or enterprise. The MasterVision Magnetic Gold Ultra Dry Erase Grid Planning Board with Accessory Kit is an excellent tool that allows you to stay on track. 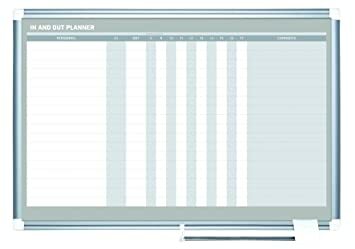 Keeping important tasks on display, organizing work-groups or just planning ahead is practical and easy with this grid planning board. This board features 1 x 1 in pale gray grid lines with an extra wide row at the top and an extra wide column to the left to allow room for headers and data. Magnetic accessory kit includes data cards, date magnets and mini magnet shapes. 48 x 72 inches. 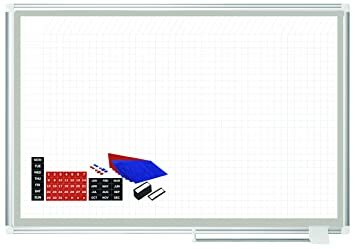 GA02109830 MasterVision Planning Board Magnetic Dry Erase In & Out Vertical, 24" x 36"
The Master Vision Magnetic Gold Ultra Dry Erase In and Out Planning Board is recommended for frequent use. It is perfect for displaying staff schedules or leaving important messages. The sliding aluminum pen tray keeps pens and magnetic accessories where you want them. This dry erase board features an easy 4-corner mounting system and hardware is included. Make changes to flexible schedules with ease with this planning board. Dry erase board measures 2 x 3 feet. Organization is vital for the success of every business or enterprise. MasterVision Planning Boards are excellent tools that allow you to keep planning and tracking on time. Keeping important tasks on display, organizing work-groups or just planning ahead is practical and easy with our many grid formats. Organization is vital for the success of every business or Enterprise. MasterVision planning boards are excellent tools that allow you to keep planning and tracking on time. Keeping important tasks on display, organizing work-groups or just planning ahead is practical and easy with MasterVision many grid formats. 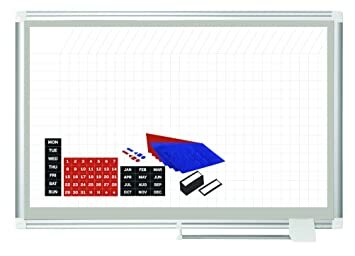 MasterVision offers an extensive line of dry erase whiteboards, magnetic whiteboards, easels, interactive whiteboards, planners, cork boards, and more. MasterVision visual communication products are designed for use in offices, schools, training centers, factories, hospitals and homes. Organization is vital for the success of every business or enterprise. Master Vision Planning Boards are excellent tools that allow you to keep planning and tracking on time. Keeping important tasks on display, organizing work-groups or just planning ahead is practical and easy with our many grid formats. Organization is vital for the success of every business or enterprise. The MasterVision Magnetic Gold Ultra 1 x 1 Inch Grid Dry Erase Planning Board is an excellent tool that allows you to stay on track. 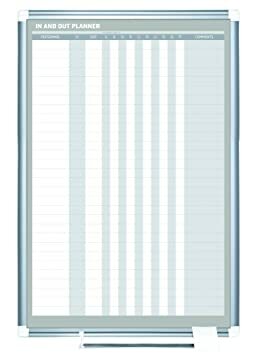 Keeping important tasks on display, organizing work-groups or just planning ahead is practical and easy with this grid format dry erase board. It features a sliding aluminum pen tray to keep pens and magnetic accessories where you want them. 48 x 72 inches. 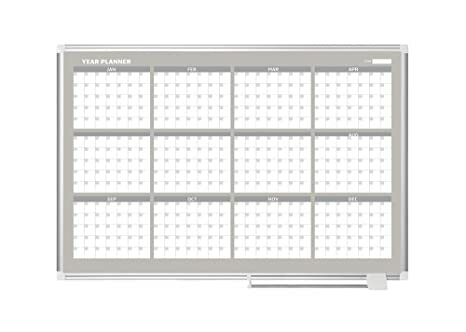 GA0396830 MasterVision Planning Board Magnetic Dry Erase, Weekly Calendar Board with Aluminum Frame, 24" x 36"
Organization is vital for the success of every business or enterprise. The MasterVision Magnetic Gold Ultra 1 x 2 Inch Grid Dry Erase Planning Board is an excellent tool that allows you to stay on track. 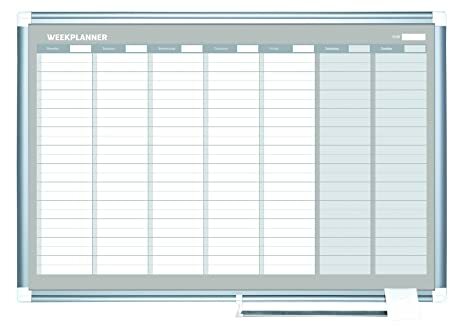 Keeping important tasks on display, work-groups or just planning ahead is practical and easy with this dry erase board. The 1 x 2 inch pale gray grid lines make planning easy and professional looking. The sliding aluminum pen tray keeps pens and magnetic accessories where you want them. Magnetic accessory kit includes data cards, date magnets and mini magnet shapes. This dry erase board features an easy 4-corner mounting system with hardware included. 48 x 72 inches. 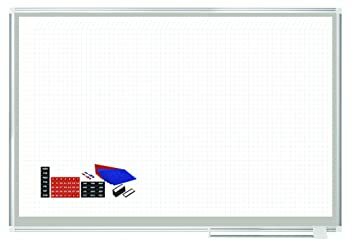 The MasterVision Magnetic Gold Ultra Dry Erase In and Out Planning Board is recommended for frequent use. It is perfect for displaying staff schedules or leaving important messages. The sliding aluminum pen tray keeps pens and magnetic accessories where you want them. 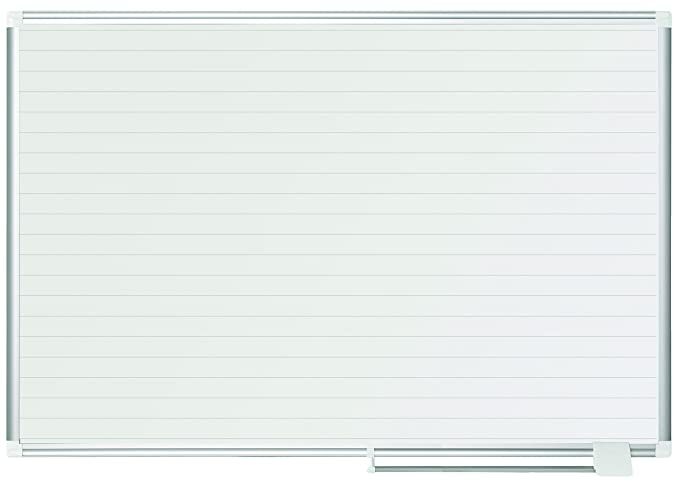 This dry erase board features an easy 4-corner mounting system and hardware is included. Make changes to flexible schedules with ease with this planning board. Measures 3 x 2 feet. Organization is vital for the success of every business or enterprise. The MasterVision Magnetic Gold Ultra 1 x 2 Inch Grid Dry Erase Planning Board is an excellent tool that allows you to stay on track. 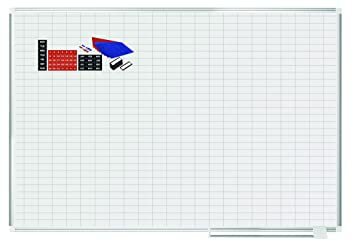 Keeping important tasks on display, work-groups or just planning ahead is practical and easy with this dry erase board. 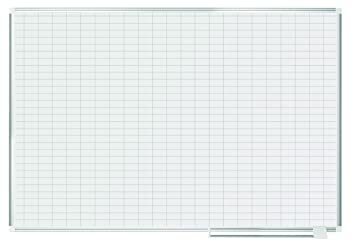 The 1 x 2 inch pale gray grid lines make planning easy and professional looking. The sliding aluminum pen tray keeps pens and magnetic accessories where you want them. 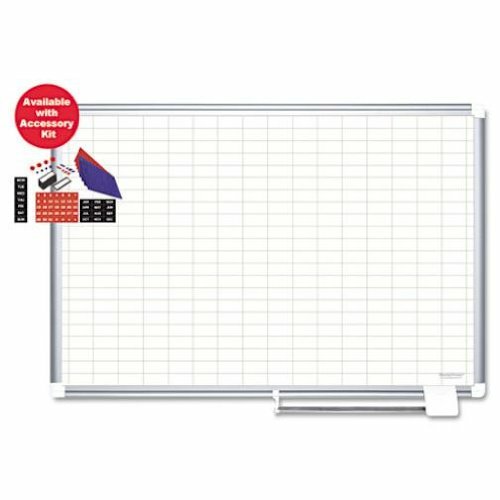 This dry erase board features an easy 4-corner mounting system with hardware included. 48 x 72 inches. 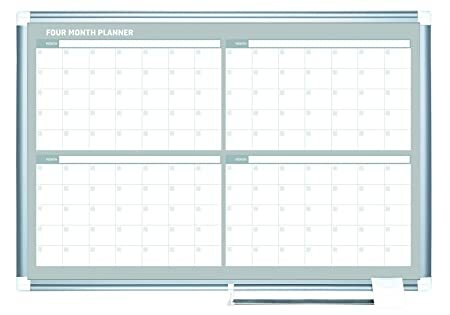 GA01110830 MasterVision Planning Board Magnetic Dry Erase In & Out Horizontal, 24" x 36"
GA0597830 MasterVision Planning Board Magnetic Dry Erase, Monthly Calendar Board with Aluminum Frame, 36" x 48"
MA2792830 MasterVision Planning Board Magnetic Dry Erase, 1" x 2" Grid Planner with Aluminum Frame, 48" x 72"
GA0594830 MasterVision Planning Board Magnetic Dry Erase, Yearly Calendar Board with Aluminum Frame, 36" x 48"